Last year 7-Eleven did a tie-in with X-MEN ORIGINS: WOLVERINE by coming out with Mutant Berry Slurpies. I was dubious about this tie in. 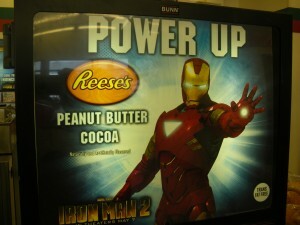 Much like I was with this year’s Marvel product in honor of IRON MAN 2… Reese’s Peanut Butter Cocoa. Peanut butter is a very tricky ingredient to use. I have found that when it is liquified it tends to lose a lot of its appeal. Peanut butter itself is kinda dry. So whatever you mix it with had better be good enough to overcome that. Secondly, I have found that when you melt peanut butter it gets an almost gritty consistency. Either way, unless you are consuming in SERIOUS moderation, this will come back to bite you in a big way. The blessing of the machine which dispensed my medium cup of peanut butter cocoa is that it was able to err slightly on the side of a weaker cup. 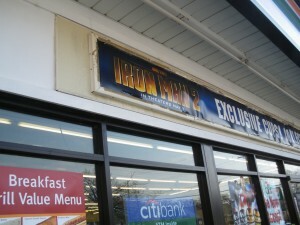 The peanut butter flavoring was there, though not really pronounced; more like a hint. It was almost to the point where I wasn’t even sure if I was imagining the flavor. As the cup went on though, the flavor was consistent enough to prove to me that it was indeed there and not some wish-fulfillment. Also, when I looked under the hood, I could see little bits of what I believe to be the peanut butter flavoring. Some might find this off-putting. I didn’t really mind. But the overall problem persists. The peanut-butter flavor caused the drink to be a bit on the dry side. (Have you ever had a sundae with peanut butter sauce, finished the ice cream and tried to take the sauce on its own? Think that.) I didn’t find it to be particularly satisfying in that respect. I needed a chaser. Not because I didn’t like the taste, but because it actually left me more thirsty. 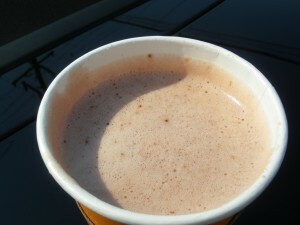 Dunkin’ Donuts has a Milky Way hot chocolate which doesn’t nearly suffer from this problem (though some tell me it’s too sweet for them, I enjoy it). Overall, I have to say this was a bit of a disappointment. Unfortunately my friend didn’t like it either, which just goes to show you… just because a flavor combo works in one medium, it doesn’t mean it will translate as well into the next.